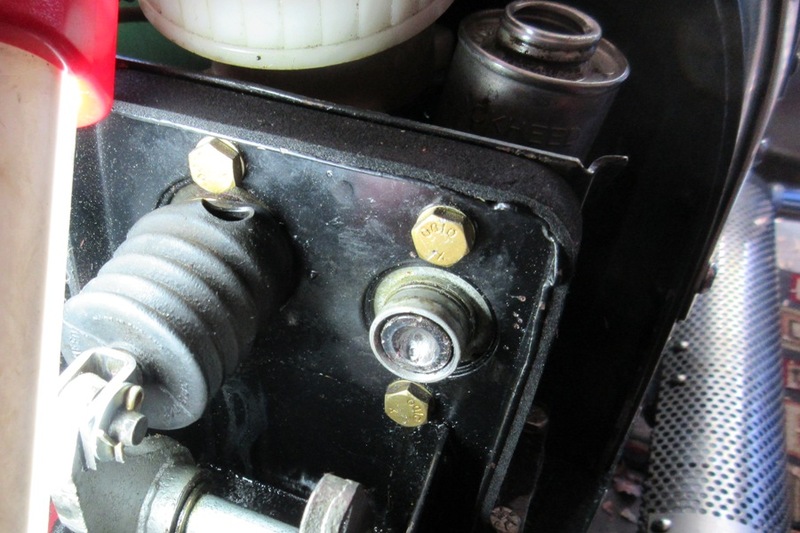 When we fixed our clutch master cylinder last November without actually doing anything to it, other than trying to take it apart, we knew it wasn't a real fix, the kind where you go about your business and not worry about it anymore. But the fix worked, although back then we had no idea how long it would last. Now we do. Ten months and 24 days. The clutch failed on a drive to Sacramento, and not so much because the seals in the master cylinder gave out, but because the clutch slave started leaking all over the ground, and all of the subsequent pedal thrashing in attempts to get the clutch to release proved too much for the 40-year-old master cylinder. We didn't realize it right away. 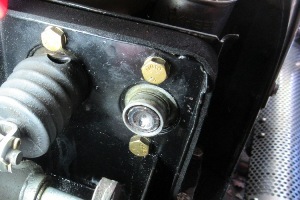 The slave had obviously failed—the master reservoir was empty and the slave was coated in hydraulic fluid—so we bought a new slave cylinder, thinking that would fix it. 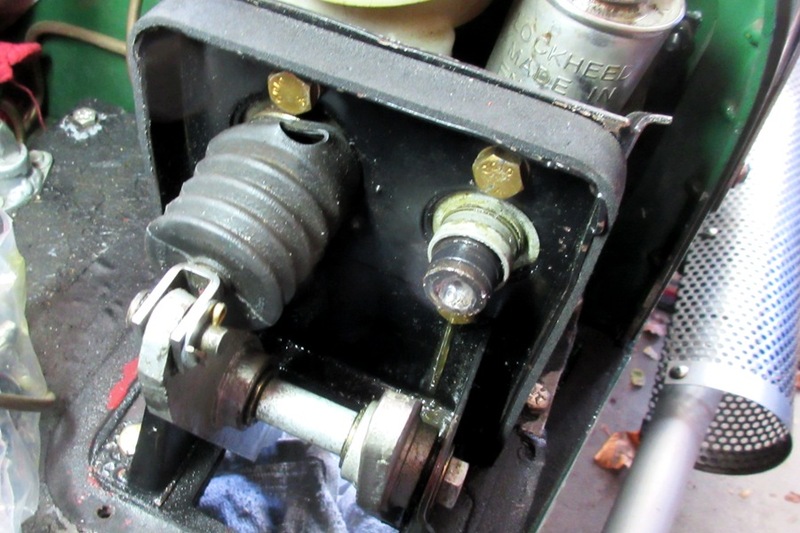 But after installation and several attempts to bleed the system, it was apparent the old master cylinder was no longer willing to push any hydraulic fluid into the lines. So we did what we normally do, we gave up and went inside, fully prepared to park the car for the winter, because we knew repairing the master cylinder would be impossible, and replacing it almost as impossible. The next day we woke up with renewed hope, heading out to the garage in anticipation of another miracle fix, but no, the clutch was still dead. 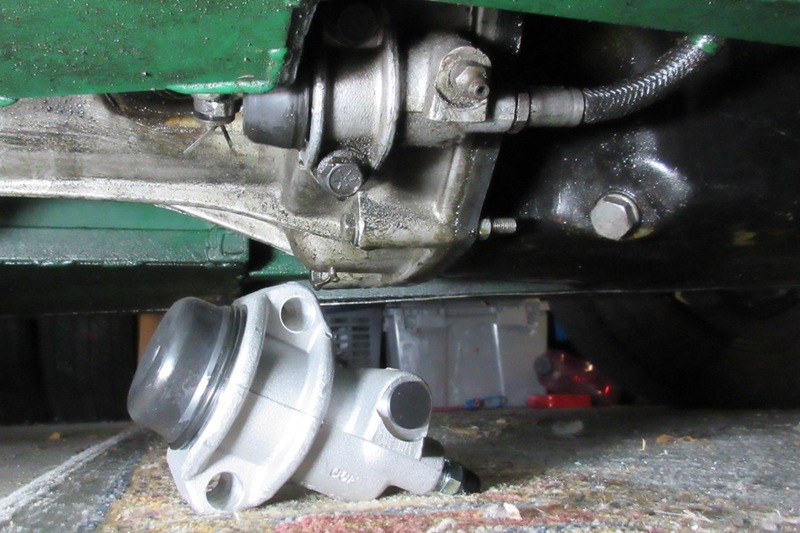 With nothing left to try, and a brand new MGB clutch master cylinder repair kit still New In Box on a shelf in the garage, we figured we might as well take everything apart. We got as far as we did last time, the master cylinder piston still trapped in its bore, but this time we noticed something different. Maybe it was our sense of desperation. We knew we had to get that piston out. So we made a decision, right there, to fix the thing or break everything else in the attempt. What was trapping the piston was a build-up of crud at the end of the bore, just ahead of the groove for the circlip that normally traps the piston. Upon closer inspection, we found the crud was mostly concentrated at the bottom of the bore, not all the way around. This made sense, as the dirt and water and hydraulic fluid that created the crud would've settled there over the years, and not so much at the top. So we started digging at the crud with utility knives and screwdrivers and files, no longer concerned with the smoothness of the bore or the integrity of the device. Without damaging too much of the cylinder, we managed to remove enough of the crud to allow the piston to slide out another eighth of an inch, which would've been a huge accomplishment except we needed it out at least a quarter of an inch before we could actually get something on it to pull it all the way out. 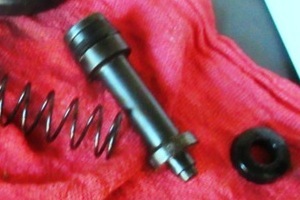 So even though the crud was mostly gone, the piston was still trapped. 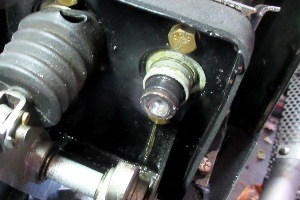 Or not actually trapped, but the old seals were working well enough to trap a bubble of air behind the piston, such that any outward movement of the piston would have to expand the bubble, and the bubble wasn't having any part of that. So we stared at that piston for a long time, and poked and prodded it a few times, but it just sat there a quarter inch from freedom, and not moving. As it happens, our NIB rebuild kit came with a new piston, so we could see what it looked like on the inside, and at some point while we were staring at the little bugger we came to the sudden realization that the old piston was no longer needed, and could therefore be altered in any kind of destructive manner, and we'd still be able to rebuild the clutch master cylinder. That's when we got out the drill. The piston proved to be an easy target for a 1/8" drill bit, so long as we didn't push too hard and aimed it at a 45 degree angle to the bore. We didn't drill all the way through the piston, but we made enough of a hole to dig the point of a small Phillips head screwdriver far enough into the piston that we could drag it out. It released from the bore with a satisfying pop, the bubble of air bursting behind it. It turned out the piston was a little too lengthy to come all the way out without hitting the top of the clutch pedal, but dismantling the pedal box was easy enough. 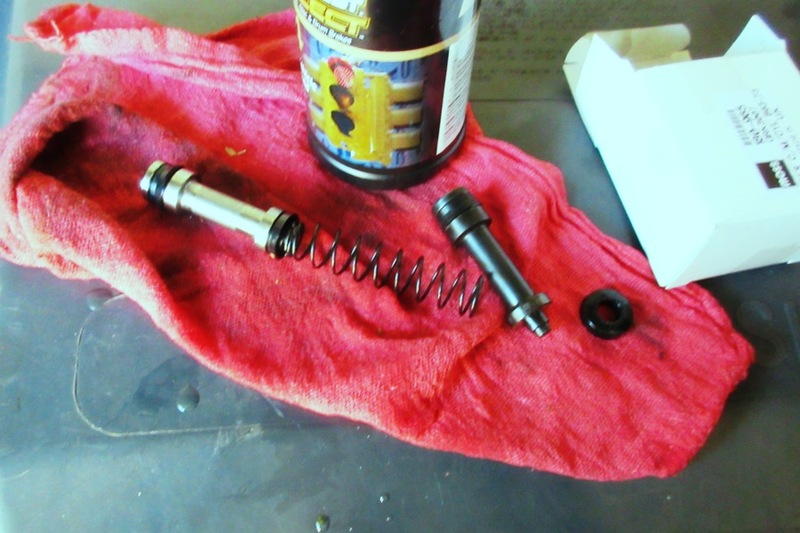 Like our old engine bearings and piston rings, the old seals in the clutch master cylinder were visibly done. The front seal was cracking, and the rear was soft and spongy. Forty years of clutching and de-clutching will do that, as will likely ten years of sitting around unused in someone's backyard. The piston itself could've possibly been reused in a pinch, except for the 1/8" hole in its face. With the sad state of the seals, it's actually pretty amazing the clutch worked at all, although we already knew it was amazing last winter when we were able to fix it without actually doing anything. The master cylinder went back together easily enough, with all new parts and nothing extra left over, always a good sign. Bleeding the lines also went well, with very few injuries, and so we now have a brand new clutch, or at least the hydraulic parts of it, and just like our new engine, it's one more part of the Locost we can stop worrying about. As a reminder to us about this, the clutch pedal feels a lot firmer now, and releases the pressure plate near the top of the stroke, which will take some getting used to but we're not complaining. That wasn't the only excitement we had this week. We also lost another tach. It didn't die the way the first two did; it suffered a much more agonizing death, the needle swinging wildly for days before finally biting the dust. Worse, we'll be driving along and the needle will suddenly pop up for a few seconds before falling silent again. So maybe it isn't dead, but just in a coma. We hope it's not suffering. 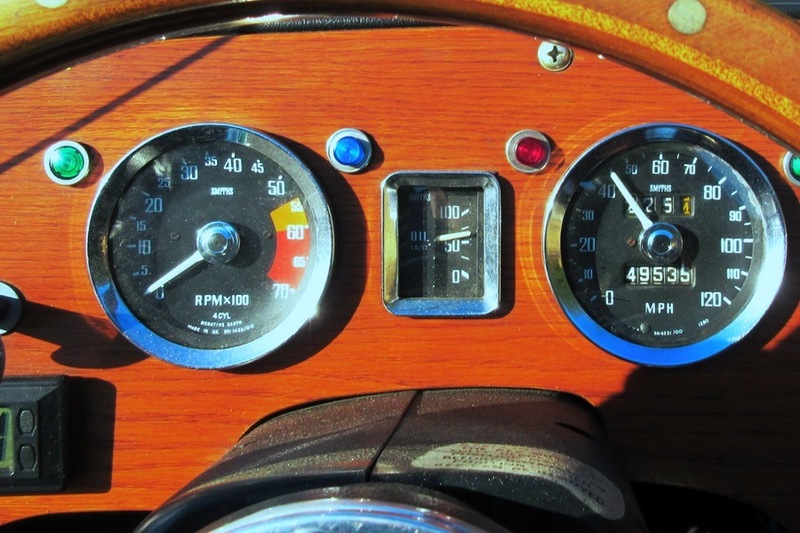 We'd pull the plug on it, but we can't really afford another tach right now, and a big hole in the dash where the tach used to sit happily counting revs all day would be tragic. 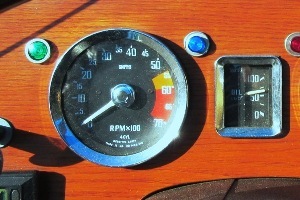 The good news is, we're not totally dependent on the tach anymore. Our refurbished engine is now fully broken in, based on 50-year-old break-in rules that prescribe a light throttle for the first 500 miles (rings), and low RPMs for the first 2000 (bearings). We're well over those minimums, and so far so good. Other than one short high-speed test, we haven't really hammered the bearings, and the rings seem fine every time we mash the throttle, which we've done a few times, 'few' being a rough estimate. We haven't actually been keeping count.